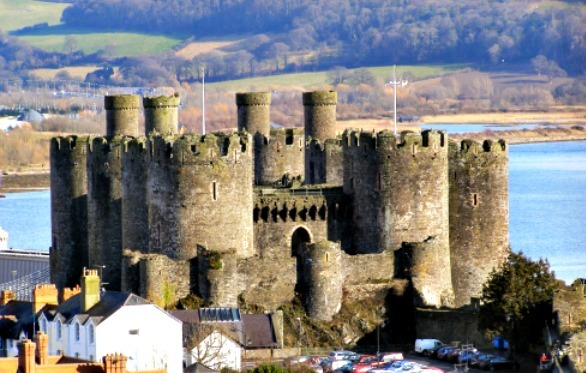 Conwy castle was built by Edward I during his conquest of Wales between the years of 1283 and 1289. The castle itself was made as part of a much larger project to create a fortification all the way around the town of Conwy. The castle has played many important roles in sever wars throughout its life time and has been occupied by many historical figures. Richard the 2nd stayed here in 1399, and by forces loyal to Charles the 1st and also Owain Glyndwr. After the occupants surrendered to Parliamentary forces in 1646, the castle was partially ruined in the aftermath. After this it sat abandoned until 1665 when the last bits of lead and iron were stripped from the castle, as well as some stone for building which left the castle in a complete ruin from that year onwards. UNESCO considers Conwy to be one of "the finest examples of late 13th century and early 14th century military architecture in Europe", and it is classed as a World Heritage site. All castles seem to have a ghost story, and Conwy is no different. There are a number of hauntings here with many people claiming various different encounters. Some of the most commonly reported phenomena are listed below. The upstairs chapel is though to be the scene of one spirit, though no one has actually seen them. Upon entering the upstairs chapel a strong smell of incense has been picked up by many a visitor, with no potential source. Several towers of the castle are thought to be the sites of an evil presence. People who have been in the towers have reported suddenly being over come with terror for no reason, to the point where they had to actually leave the castle. There is a window over looking the road from the castle, and it is within this window a man wearing a full suit of armor with helmet has been seen staring out, partially lit up as if a candle were in the room. Apparitions of various kinds are frequently reported by visitors to the castle. Ranging from men and woman in period dress to dark shadowy figures who stand silently and stare at people from the ramparts. The other commonly sighted apparition at the castle is that of a monk who appears to be floating slightly of the ground with no feet at the bottom of his robe. His face has been described as being a shadowy shape with deep empty black eyes.